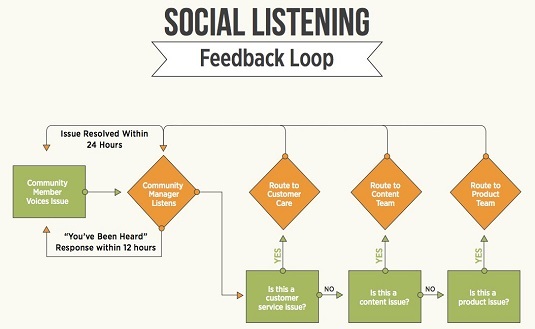 After you locate mentions of your brand on the social web, it’s best to respond inside your social listening campaign, which you do by creating and implementing various feedback loops. Generally speaking, a feedback loop is a procedure that helps businesses respond and address customer issues on the social web. It often works behind the scenes of the public-facing social media, but it’s an important step in making sure that your prospects and customers feel valued and heard. Feedback loops seek to accomplish a communicated resolution to customer issues with a predetermined period of time. A flow chart for setting up feedback loops. Say that a customer raises a concern that directly or indirectly involves your company, products, or services and posts on Twitter, for all the world to see. In the age of social media and digital communication, this is a common occurrence. That’s why the first line of defense in the feedback loop is your community manager, the person at your company who monitors the conversations happening on the social web. Your company might use a paid tool like Mention or Radian6, described earlier, to listen for these complaints as they happen. You might have multiple community managers, or you might be the community manager. In any case, someone must be listening to the social web when your customer voices the issue. Sometimes issues simply can’t be resolved immediately, and that’s okay. Just letting customers know that their message has been received is enough to make them feel respected and appreciated, and will buy you some time to find the resolution. Imagine being a waiter at a busy restaurant during happy hour and an unexpected table of ten walks into your section. At the moment, you don’t have time to take this table’s order or even drop off water. What can you do to buy yourself some time? You stop by the table, verbally acknowledge your customers’ arrival, and inform them that you will be with them shortly. This is called the “You’ve Been Heard” response, and it’s a powerful way to de-escalate situations — both for busy restaurants and on the social web. The social media universe moves lightning fast. Twenty-four hours might as well be a thousand years, especially when unhappy customers are involved. That’s why having someone in your company who is listening to what’s being said and responding to issues quickly is crucial. It’s good to try to respond within 12 hours to Facebook messages and even quicker on Twitter, a channel with even less patience. This first-response time depends on the size of your company, so it’s important to sit down and think about how quickly your organization can respond and what your feedback-loop time frame looks like — just be sure that customer service issues are addressed the same business day that the issue was raised. After you’ve identified an issue and made the first response, your next step is to determine who in your company’s hierarchy is equipped to resolve the issue. Most important is to realize that many different kinds of feedback loops exist, so where you route a concern relates to the size and organization of your company. One of the most common feedback loops is the customer service loop. When someone raises a customer service issue on social media, the community manager can route that issue to the customer care department. But you can structure all sorts of feedback loops. Perhaps a customer informs you of a broken video on your blog. In this case, the community manager routes the issue to your content team or, perhaps more specifically, to the managing editor of your blog. Customers can have all sorts of technical issues with your products and often take to social media with their frustrations. Addressing the concerns quickly and making sure that the right people in your company know about the problem are the most important actions to take. By no means are feedback loops limited to the categories just mentioned. Perhaps your legal team needs to be in the know on certain issues. Maybe your CEO wants to address particular issues that people voice on social media. Or your products team may want to know how customers are describing and feel about the characteristics of your products. Regardless of the type of feedback loop that your community manager identifies, putting a consistent response procedure in place is crucial. If a resolution is required to resolve the issue, who responds to the customer — the community manager? The customer care team? Or should you assign particular people in each department to handle responses? Ultimately, the decision depends on what makes sense for your team. Just remember that in a perfect world, a resolution should be presented to the customer within 24 hours of the original complaint. Many social listening tools are available to make this process much easier. Tools tlike Mention and Radian6, can equip your community manager with live streams of social media alerts based on specialized keywords. These platforms can also assign individual comments and tweets to specific members of your team, making the feedback loop process easier to implement. Reply to the issue within a designated amount of time. If you can communicate a resolution immediately, do so. Often, however, other people in your organization need to get involved in the conversation. Meanwhile, the customer should at least receive the “You’ve Been Heard” response in a reasonable time frame. Your business should decide what that time frame is, but remember that if you wait beyond 12 hours for any contact with the customer, you risk causing even more frustration. Move the conversation to a private channel. Don’t try to troubleshoot a customer-care issue on a public forum like Twitter or a public-facing Facebook page. Issues are much easier to address one-on-one. Giving customers individual attention also makes them feel appreciated and heard. Many customer-care issues also involve private information like email addresses and credit card info, so you want to be discreet about your customer’s private details. Your company decides where this private conversation takes place, whether by phone, support ticket, or a private message on the social channel. Any company with solid social customer service in place uses this three-step plan. This image shows an example of the hotel chain Best Western responding to a customer service issue posted on Facebook and moving the conversation to a private channel to be addressed. 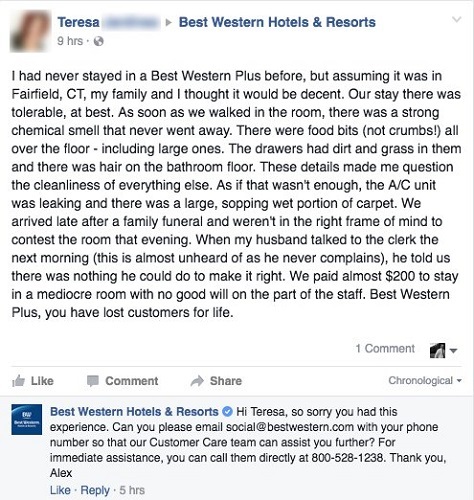 Best Western moves a customer complaint to a private channel.